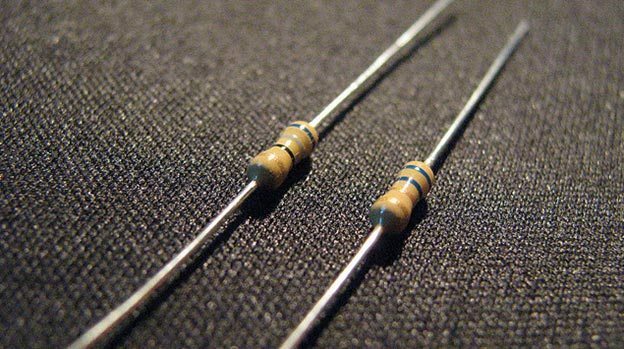 Resistors are one of the simplest varieties of electronic components. A resistor is a two-terminal device that has a fixed relationship between the current passing through the device and the voltage drop across the device. This relationship is described in Ohm’s law, which states that “the strength of a direct current is directly proportional to the potential difference and inversely proportional to the resistance of the circuit” (Merriam-Webster). Although resistors are very common and simple devices, the different composition types of resistors are often misunderstood. Carbon resistors are the most common type of composition resistors. They are inexpensive, and serve a general purpose in electronic circuits. Consisting of carbon particles mixed with a binder, carbon resistors are molded into a cylinder and baked. The carbon particles mixed with the binder (usually ceramic) are the resistive element, accompanied by embedded wire leads or metal end caps to which the lead wires are attached (Figure 1). A film resistor uses a film of carbon that is deposited (either sprayed or coated) onto a substrate, which forms the resistive element. The resistance is adjusted by cutting or shaping the film. Wirewound resistors are made up of metal resistance wire (usually nichrome), and are made by winding the wire around the insulated core of the resistor. Wirewound resistors have a poor frequency response and are typically only used in low frequency applications. There are several resistor calculators that can help you figure out what resistor is needed.